For sure, owning your own business you have to have an inner drive and motivation that never gives up on you, call it blind faith, call it tenacity, determination, call it what ever it is that gets you up in the morning, even when you go to sleep feeling exhausted and unsure that tomorrow will bring you the inspiration and energy that you need once more. The drive and positivity of a business owner is one of the aspects that set’s us apart from many others ‘workers’. Goal setting and clarity of vision is personal and focused on the belief that you will be successful and you will have impact. 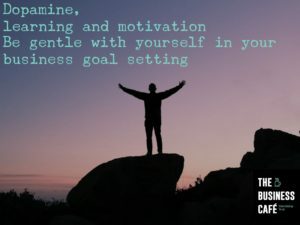 I was introduced to goal setting by Thomas in 1989 (husband), when we met and decided to spend the rest of our lives with each other (within 3 months), he arranged a private 121, 2-full day sessions with a facilitator of Brian Tracey’s Course, all about goal setting and life’s purpose and dreams. It was very powerful to experience together. Since that day, we always set goals, personal, family and business ones. Every New Years Eve,, we reflect on the past year and plan the following. However, around 6 years ago, we both fell out of love with this process, we still set goals, but far more casually, they were more realistic, closer and somehow, they were more comforting. I have often wondered why we toned them down. Was it that many had been achieved, family, personal ones, was it that our business goals had been dashed? Was there another reason, an inner wisdom from the experience of using them. Not having them, didn’t stop us from working hard, driving ourselves, our motivations remained high. Each year we moved forwards in some way, external challenges meant some others were carried over. We had been through some tough times, we were definitely in retreat for a while. Last week, driving home from Peterborough, Radio 4 had an amazing weekly show on called ‘All in the Mind’. 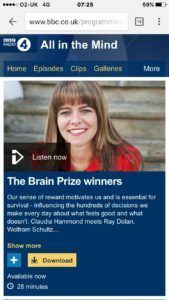 Hosted by Claudia Hammond In this show they interviewed 3 Professors who had won money for their work on dopamine and the human mind, looking at what impact it has on our reward system, our drive, motivation and joy. An organic chemical that plays several important roles in the brain and body. In the brain, dopamine functions as a neurotransmitter—a chemical released by neurons (nerve cells) to send signals to other nerve cells. The brain includes several distinct dopamine pathways, one of which plays a major role in reward-motivated behaviour. Most types of rewards increase the level of dopamine in the brain, and many addictive drugs increase dopamine neuronal activity. While I was listening to the program I was thinking about the addiction to work, (not to drugs, alcohol, sugar or cigarettes). My mind focused on the ‘reward-motivation’ of how we all keep working in our hives, sometimes relentlessly in pursuit of a reward, a goal, a result. I am in awe of small businesses. The rewards come at random times, the reward to work ratio can be small at times, yet, we strive and keep seeking new pathways to witness and experience the reward. 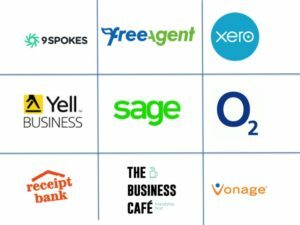 The reward is not always money; it can be achieving a task, learning new skills, seeing a happy customer, reading a great endorsement. Many things that deliver a feeling of moving forwards and having impact. In the program one Professor did an experiment on the host of the show. He offered her £10, just as a gift, she thanked him, asked why, he replied just ‘because I have it’ and then he offered her £20. Again, she thanked him, laughed and was grateful. Then he said ‘Wait a minute, I have £30 to give you. Smiles and laughter continued. He then reached into his pocket and said, ‘oh, wait a minute, I only have £20.00, here you are’. The impact was that hopes were raised and then dashed. 3 minutes before she wasn’t having any money, no reward; now she felt ‘hard done by’, or at least her receptors in the brain did, the dopamine impact had taken over rationale thinking. Her brain was seeing a larger achievement than the one she ultimately got. This returns me to goal setting and managing our life day to day. How hard are we on ourselves, how big a mountain do we set ourselves to climb. Do we allow the time that the HUGE mountains we seek to climb need, or do we need the reward faster than we could possibly get to the summit? So, I hope this creates a conversation today. I need it, and perhaps others do too. Being kind to ourselves and creating way for our friendly dopamine to work for us and not against us is critical, tiny steps, realistic goals, noticing the small rewards that spark our dopamine, and noticing them in many forms, these are the things that help us all I suspect. I look forward to your thoughts on this today.